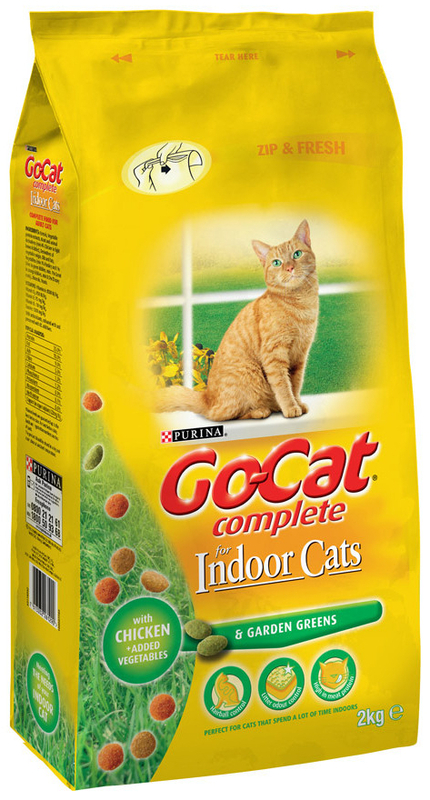 Go Cat Complete Indoor are a range of complete foods for cats that are usually indoors. They contain a complete range of nutrients to provide your indoor cat with the balance she needs to be healthy and happy. The food contains selected delicious meat and garden greens to create a highly palatable diet that your cat will look forward to every day. The food contains an optimum balance of calories with protein to ensure that your cat does not gain any excess weight. It also contains chicory which helps to support the digestive system and to prevent faecal odours. It will also help to eliminate hairballs and the discomfort that they can cause. Cereals, Vegetable Protein Extracts, Meat and Animal Derivatives (min. 4% Chicken in Light Brown Kibbles), Oils and Fats, Derivatives of Vegetable Origin (min. 1% Parsley in Green Kibbles), Vegetables (min. 1% Vegetables in Orange Kibbles, min. 0.5% Chicory Roots in Light-Brown Kibbles), Yeasts, Minerals, Fruit (min. 1% Olive in Green Kibbles). Vitamin A: 15,000IU/kg, Vitamin D3: 1,200IU/kg, Fe(E1): 55mg/kg, I(E2): 2.1mg/kg, Cu(E4): 10mg/kg, Mn(E5): 6mg/kg, Zn (E6): 80mg/kg, Se(E8): 0.13mg/kg, E516: 5,500mg/kg. 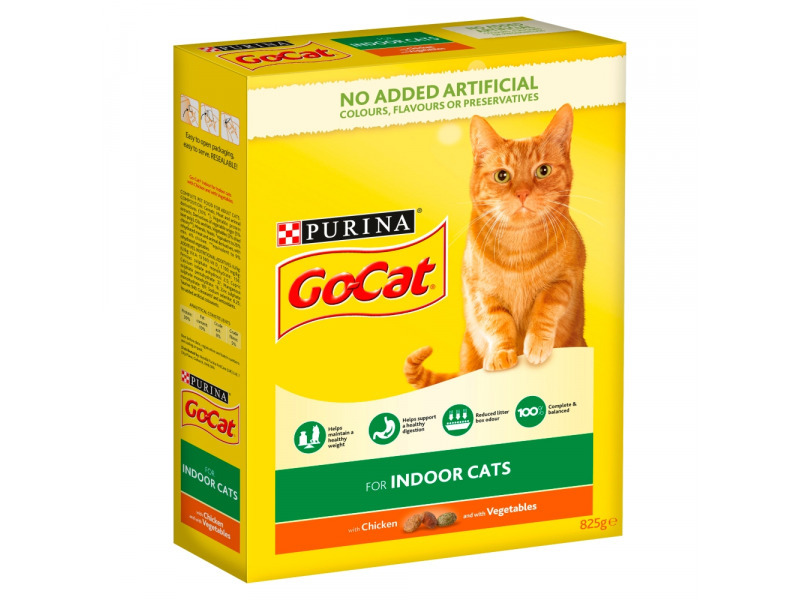 Go-Cat for Indoor Cats is the perfectly balanced meal for cats that spend most or all of their time indoors. These guidelines are based on moderately active indoor cats. Individual needs vary and feeding should be adjusted as required. Fresh, clean water should always be available. There are currently no questions for Go-Cat Complete Indoor Cat Food - be the first to ask one!